I am honoured to write for Noor Kadiwalla’s music site ’the future elements’ and, when asked to join, was seriously impressed with his vision for the site. This is, afterall, the man who is one part of ’the eternal twilight’ and the driving force behind the ’Hope for Japan’ compilations. 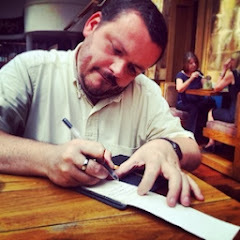 He sees the site as being a springboard for musically creative endeavours such as releasing music and compilations. 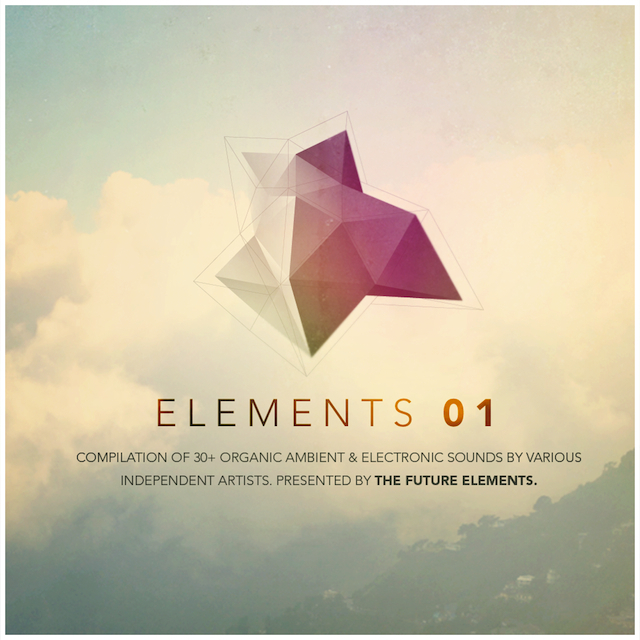 And it is to the first compilation - ’Elements 1’ - that I turn my attention... not just because I was able to watch it evolve... nor because I was able to secure a space for a Cousin Silas track... but because it is very, very good. It is a compilation of 35 truly excellent tracks... leftfield music that resides in the intersection of ambient, electronic, post-rock and neo-classical... that wonderful no-man’s-land that I love so dearly. Firm favourites of mine are represented: Lowercase Noises, Sky Flying By, Apta, Good Weather for an Airstrike, Anoice, The Mountaineering Club, The Echelon Effect, Inachus, The Sound of Rescue, My Cats a Stargazer, Umber, Will Samson and Cousin Silas. Bob Guido, Until We Last, Absent Hearts, Nitin Garg (who also created the artwork), Kyle Bobby Dunn, Heinall, Tipu Sabzawar, Josco, Pleq and the wonderfully titled the Golden Gonk... to name but a few. 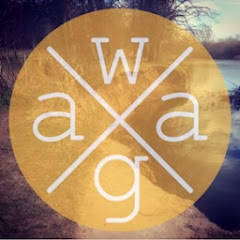 It is through compilations that I have had the opportunity to hear fresh, new talent... and whilst it is becoming a bit of a tradition to compile and release compilations within this community, it is a tradition I would actively support and endorse. Music needs to be heard... and these compilations are one fantastic means of getting heard and also hearing new talent. This was why I jumped at the chance of submitting a Cousin Silas track from an upcoming release on my fledgling netlabel... it is fantastic exposure. ”Hazy fields are breathing” by Nitin Garg... a gentle ambient piece with a deep drone underpinning an infectious guitar-drive melody. This album is first class and I am not saying that because of my involvement, however minor, from it is conception... it is first class and deserves to be call out as such. I have embedded the Bandcamp player below. Take time to listen to it and download it for free. You won't regret it. Have downloaded. Thank you to everyone involved. 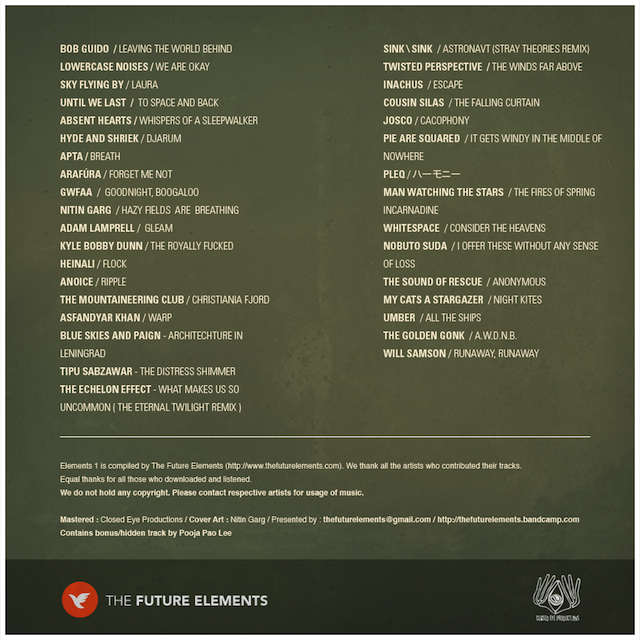 Just listened the future elements compilation... truly amazing. I felt like your track could have been in any movie or TV show. As a filmmaker myself, I'm definitely going to keep tabs on your work and other artists from the future elements comp; hopefully one day I'll ask you to compose something like this!